Happy Holidays! Here at the Reeve house we’ve had our turkey with all the fixings, opened presents, watched more James Bond, and talked to family in the UK. We went to my brother’s house for breakfast and watched my niece and nephew open things. It’s been an excellent, quiet day. One of the reasons I love Christmas is because my wonderful friends and family give me a lot of things to inspire me. I keep a lot of books on my Amazon wishlist, and every Christmas I get a great pile of new books and ideas to get my creative juices going for the new year. This year was no exception. I got a great little Acer netbook from my in-laws, which is much needed and appreciated after my beloved 4-year-old iBook died on me in September. Adam gave me a positively ingenious invention called a Slanket, which is a blanket with sleeves. I was asleep under it most of the afternoon. He also gave me a beautiful sapphire necklace. But on to the books! 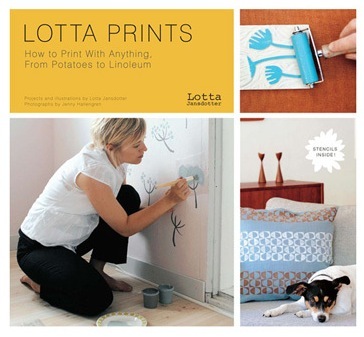 Lotta Prints by Lotta Jansdotter is a great intro to home printing, and I am now full of ideas and experiments to try. Simple Sewing with a French Twist by Celine Dupuy has charming designs. For the yarn arts I got The Opinionated Knitter by Elizabeth Zimmerman, Domiknitrix by Jennifer Stafford, and Creepy Cute Crochet by Christer Haden. My new cookbooks are Top Chef: The Cookbook and the reprinting of James Beard’s Fireside Cookbook. And my new fiction tomes are The Tales of Beedle the Bard by JK Rowling and The Art of Racing in the Rain by Garth Stein.